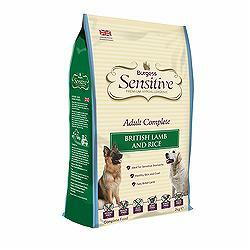 Burgess Sensitive British Lamb and Rice dog food is free from wheat gluten, maize, eggs, beef and dairy products. Rice is the main carbohydrate for energy and beet pulp aids healthy digestion. British lamb provides the essential muscle building protein. It is suitable for all adult dogs but is particularly good for those with sensitive digestion. Ingredients: Lamb Meal (min 26%), Rice (min 26%), Beet Pulp, Poultry Fat, Salt, Vitamins.